I want to start this one with thanking JopieK for his powered up tear down ! Without this info I would have had to do a lot more work before doing this. So instead of having a lazy sunday afternoon , I decided to take up one of the challenges TLG gave us with powered up. 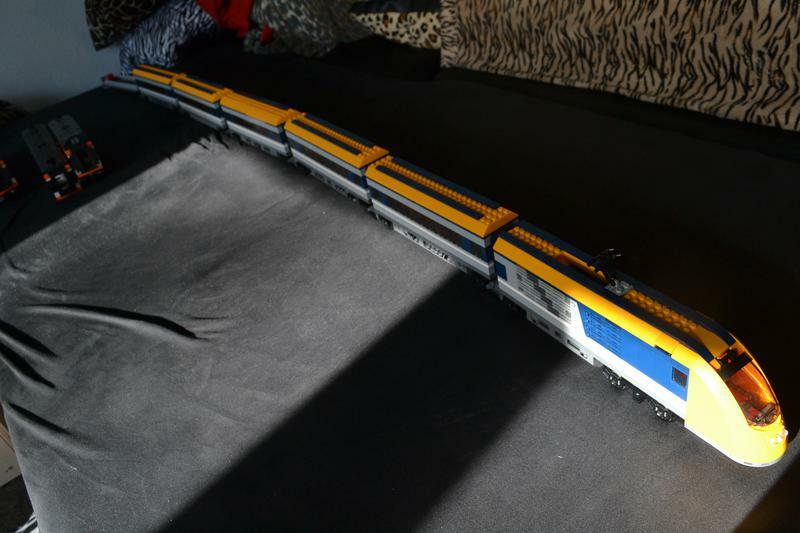 I'm in the proces of modifying a 60197 with longer bases and 7 cars at the moment. I wanted to power this beast with 2 motors so I could add even more cars in the future. So I took apart 2 PUP motors and removed the wiring from the PCB on the motor. I then soldered a piece of flatcable in place to get me through the base plate. I had to modify the base plate a little (...) to able to fit 1 motor as a jacobs bogie. Then i soldered the 2 flatcables to one of the removed motor cables , effectively switching both motors in parallel. In one of the motor assemblies I also turned the electrical motor around 180 degrees to get both motors rolling in the same direction. Some heavy mechanical modding had to be done to achieve this. I can probably find a better way if I put my mind to it. Have fun doing this for yourselves and don't hesitate to ask ! And they run both in same direction? Cause one engine is mirrored, no? Can you tell us, how well this works? I'm a little bit afraid the H-bridges in the hub are not strong enough for two motors at full load but of course this has to be tested. Everything described here is on your own risk. Having experience in soldering thin wires is a really good idea! A short check with JopieKs images from the interior of the train motor shows, that it is riskless to switch two motors parallel, since ID pin 1 is connected to VCC and ID pin 2 to GND. The only effect to the hub will be a lower wire resistance for the two ID pins. BTW, the plug ... Up to now I haven't found the type of the plug. Does anybody have further information what the hell the plug type is? Or is it a custom design for LEGO? Uh oh, Please put both motors with the cable one to one parallel on the table when you solder them together: Wire No1 / motor 1 and wire No 1 / motor 2 to wire No 1 of the plug and so on. If you turn one motor by 180 degree you will change the enumeration of the wires a fatal short will be the result. The only way to change the motor direction is to exchange wire 1 with wire 2 in the motor housing as correctly described by duifkelego. I thought the same about the H-bridges but decided to take the risk and find out the hard way. I've phisically rotated the motor 180 degrees inside it's housing so I could keep the wiring the same. I had to hack some plastic out of the housing to do it . Giottist's solution can be done as well, I'll probably be eploring that opion too very soon!